That’s my personal Facebook profile photo, not the one on my new author’s page–which I’ve recently created upon realizing that, if my only Facebook presence is my goofy personal profile, of course my goofy personal profile will start showing up anywhere Facebook touches. Which is exactly what’s happened. Oh, don’t fret (for that matter, I’m sorry to disappoint), there’s no scandal here. I was just amused when a Google alert led me to this cool wordpress site dedicated to reviewing a short story daily, where they reviewed my dark fantasy “A Wizard of the Roads” on December 21st. First off, I’m downright squeeful to see my writing was used somewhere to celebrate that day where non-Maya across the world panicked based on their misunderstanding of a sophisticated culture’s complex calendar system and decided the only imaginable outcome was the world’s magnetic poles flipping and everything going asplode. The actual Maya, from what I’ve heard, were themselves troubled by the fact that they were not permitted to practice their actual beliefs on their ancient cultural sites. Isn’t life funny. I see the above paragraph suddenly became a bit snippy. Sorry, there hit a point around the end of November where I began getting tired of telling people that, among other things, “No, the Maya really do exist in the modern day! They’re not extinct! But that doesn’t mean the world will go aspolde on December 21st!” A weariness I’m sure many other rational human beings shared. But that’s in the past now, we’ll never have to go through it again (at least not for another Long Count…good enough for me) and in the meantime, lots of fun end-of-the-world jokes were had at the expense of the foolish panicking non-Maya folk. And in addition, there I am in all my Facebook profile glory, decked to the nines in an Eighth Doctor cosplay. I know, I know, and you’re right. The Doctor Who TV Movie wasn’t even good. But that was not the fault of Paul McGann or his wardrobe. As it happens, both were present at the convention where that picture was taken, Gallifrey One 2012 in Los Angeles. Even as this post goes live, I’ll be attending my second Gally. This is because–in part thanks to the incomparably gracious Mr McGann’s presence (December 21st jokes aren’t the only thing I can go squeeful about), and which makes up part of the reason I am keeping this peculiar picture as my image to the 1 billion users of Facebook and beyond–it was some of the most concentrated, unadulterated fun I have ever had in my life. There’s something about being completely immersed in a subculture where you understand all of the references. It’s like you already know everybody before you get to know them. It’s fandom come to life–which could potentially be a horrible thing, I guess, but this is the *good* side of fandom that organizes and hosts conventions, and to someone who is usually just an online fandom lurker this was mind blowing. -I am wearing a 19th century gentleman’s waistcoat and green velvet frock coat (not actually 19th century; a friend sewed them for me, but still). This is the stuff Oscar Wilde fantasies are made of. -I’m not usually one for photographs (I’ve just discovered, since the beginning of 2013, how to use both my netbook’s webcam and the camera function on my archaic flip phone), so pictures of me are not dense on the ground. I’d venture to guess that the majority of the pictures of me online are of me in that costume, taking during 3 days in February 2012 (including the picture of Paul McGann kissing me on the hand after I sloppy fangirled all over him. Now you understand the ‘incomparably gracious’ epithet). I return from LA on the 18th, but as this will involve a flight across the entire continental United States I expect to be jetlagged and good for very little for the duration of next week. That doesn’t mean I won’t gamely try to keep abreast of things (in fact the night I wrote this post I drafted several others so I’ll be able to keep updating this blog come heaven, hell, killer flu, or Cybermen invasion). Concerned readers should probably prepare for a second influx of cosplay pictures, though. 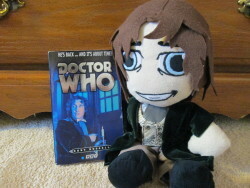 Along with my Eighth Doctor plush toy this time.